Concept is everything. Especially when working on a classic. In Ben Diserens’s Beckett in Benghazi, the madcap director Judy has the wild idea of taking her production of Samuel Beckett’s Endgame and transporting it to Benghazi. Inspired by the attacks in Benghazi on September 11, 2012, Judy takes her “artistically” driven Beckett play and uses it in attempts to make a political statement. The outcome of the play within the play is tragically hilarious. Unfortunately the execution of the real play is a bit disconnected. Diseerens’s script is filled with inconsistencies. Though the inconsistencies are quite wonderful. Beckett and Benghazi has three basic ideas that try to work together as one but rarely do. At the beginning of the play it’s a bunch of clowns performing Beckett. Then it’s a bunch of clowns trying to tech a play. Then it’s a company of theater artists talking about Benghazi and politics in general. If the script focused on two of the three, like eliminating Endgame and pigeonholing it into the plot or dismissing the clowns (despite some phenomenal clowning by the ensemble), the play may have been much more successful. Beckett in Benghazi suffers from too much at once. Again, while the pieces were wonderful, they didn’t complete the same puzzle. 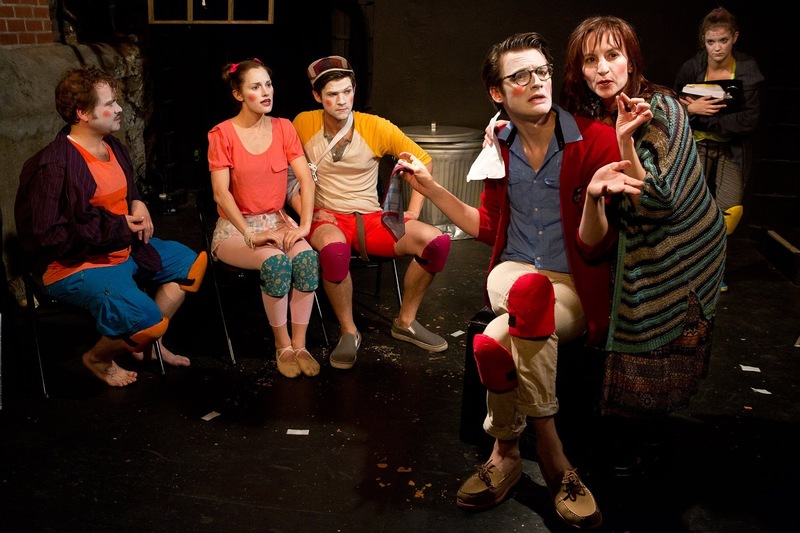 One of the most drastic jumps the play had was the politically powered acting exercise the cast explored that leaped into the hilariously farcical final product the director concocted. Both good, they just didn’t mesh. The ensemble of six were quite fun and engaging, led by strong turns from Patrick Dooley, Rachel B. Joyce, and Brendan McDonough’s clown work. All three did a phenomenal job with their physical comedy. Becca Ballenger as Lauren, the unfortunately stereotypical stage manager, showed great depth and heart throughout. Director James Presson did a wonderful job leading his company from scene to scene, discovering what each scene wanted to showcase, though landing laughs seemed difficult with the audience I was with. The overall design was good. Sara Donovan’s clever costumes were amusing. Megan Lang’s lights worked well for the piece, allowing the play to remain theatrical. The only complaint I would have is the inaccurate time period pre-show soundtrack. It got the audience in the mood, but certainly there’s enough music from Fall 2012 to chose from. Beckett in Benghazi has the potential for something great. It needs more time to decide what exactly it truly wants to be. Once it does, look out for it again because it does have its moments.